Today we’re excited to share our latest updates to Moz Local. Moz Local is unique in that it serves a large number of small business, enterprise, and agency customers. Today’s release has something for all of our customers, and we believe it’s an important step to providing the best value to everyone, independent of their size and shape. What are we announcing today? We’re announcing an exciting set of new functionality and integrations for local marketers to help them be more productive and more effective, and a collection of new product packages. All of this is designed to help you — local businesses, enterprises and agencies — make Local your advantage. Try the new Moz Local today! Google My Business (GMB) is Google’s tool used by businesses to manage their online presence across Google, including Search and Maps. Now Moz Local automatically associates your GMB listing(s) with your Moz Local listings, enabling you to push updates to, and continuously sync any changes with GMB. Ensuring that your data is accurate on Google is essential to appearing and ranking higher in local pack search results. 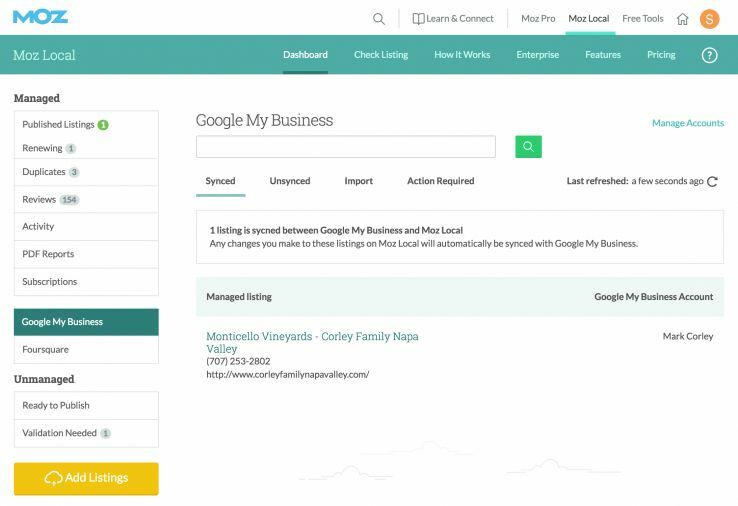 With this major new feature life just got easier — you no longer have to manage in both Moz Local and Google My Business. You can now manage all your local data from a single dashboard without ever going into GMB again. 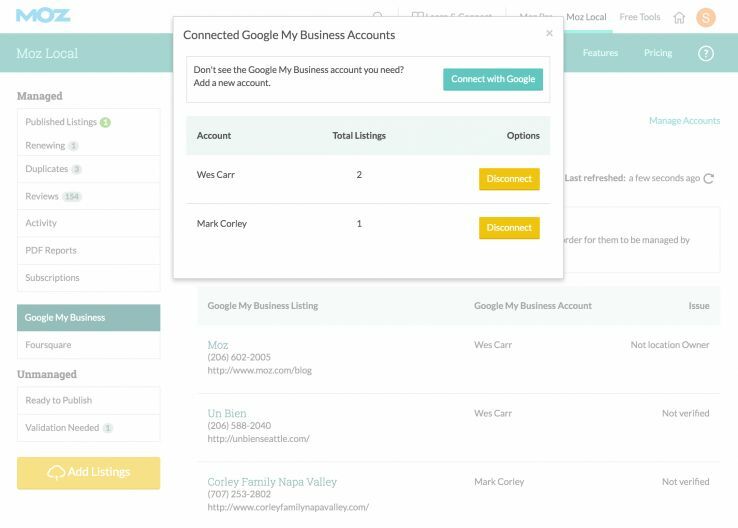 Connecting your Google My Business account to Moz Local is a snap. Your Google My Business listings are automatically associated with your Moz Local listings and any changes in either Moz Local or Google My Business automatically sync between the two systems. 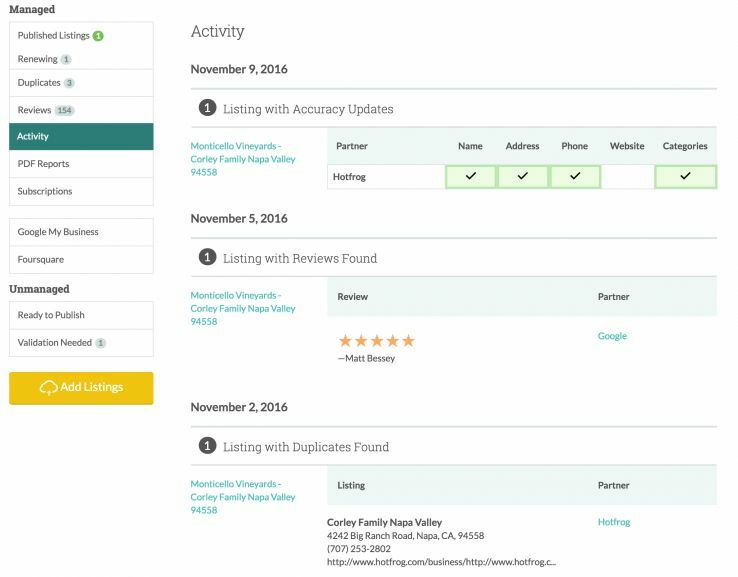 Continuing our focus on automating distribution to the services in the local search ecosystem that most impact local search results, we’ve added active management of listings on 5 new services. Hotfrog: One of the most prominent directories for years, Hotfrog is a mainstay of the Local Search Ecosystem and we’re proud to add them to our direct network. Apple Maps: Our new partnership with NavAds now gives us direct control over 4 other data sources — the first being Apple Maps. 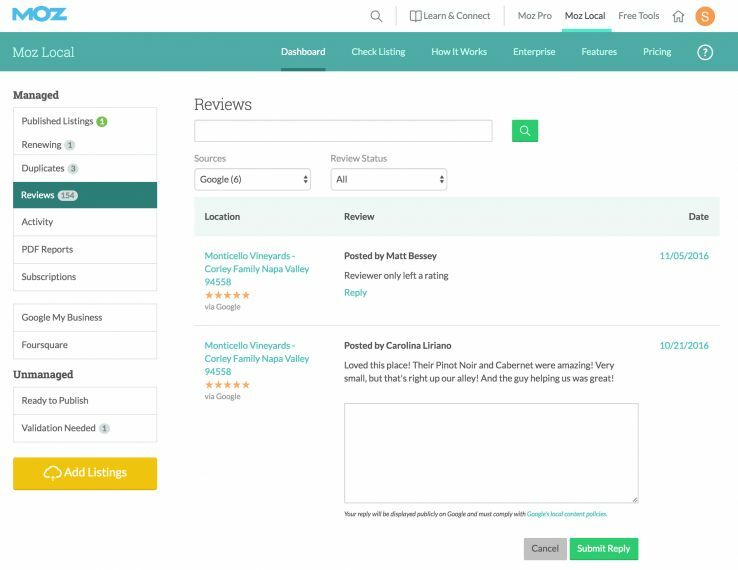 Now you have direct control over your listing information on the second-most popular navigation platform out there. Here: Next we have Here, which powers the mapping platform for Facebook as well as many other navigation networks worldwide. TomTom: One of the most popular GPS systems for cars in the country makes TomTom another vital addition. Navmii: Rounding out our complete mapping coverage is a Navmii, another growing mapping and navigation platform. The best approach to local marketing is one that’s proactive. One of the most frequent complaints from businesses everywhere, regardless of size, is that Google can sometimes change your business information without warning. Though active location data management can help mitigate this, elements like “store hours” can still change, which can be detrimental to your business. Listing Alerts returns your control, notifying you immediately in our new Activity feed whenever your listing information is changed. This means you can proactively correct the problem, preventing potential complaints from customers, your organization, or your client if you’re an agency. This feature is especially powerful for enterprises and agencies who manage listings at scale. Consumer reviews are becoming more important to local search ranking. In this update we’ve added Google reviews to our list of the most popular review sites that you can monitor from your Moz Local dashboard, also including Citysearch, Foursquare, Superpages, YP, and Yelp. Now you can get Google reviews from Google My Business and reply directly to them from your dashboard. And for other review sites, our workflow provides direct links to the specific reviews on those platforms for fast action. Additionally, review notifications ensure that you never miss a review by showing you when you’ve received new ones. Now you can get Google reviews right in your Moz Local dashboard — along with reviews from CitySearch, Foursquare, Superpages, YP, and Yelp. 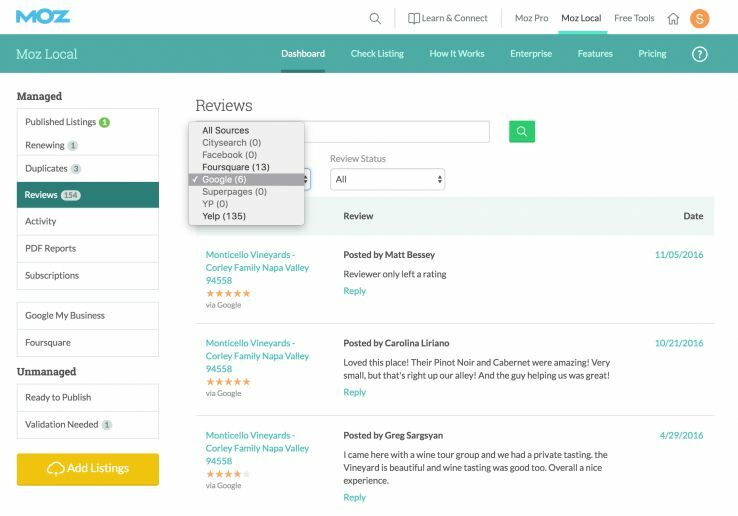 Now you can respond to Google reviews directly from your Moz Local dashboard. And for other review sites, our workflow provides direct links to the specific reviews on those platforms for fast action. What are the new product packages? Moz Local Essential is our new entry-level solution, designed to enable local businesses with one or dozens of locations to easily capitalize on best practices and the latest trends in local SEO. This package offers our industry-leading Active Location Data Management, including Google My Business Sync. In addition, Reputation Monitoring and Management is integral in this package since reviews are becoming more important in local search ranking. At $99/location per year, it’s packed with functionality — while remaining priced less than 50% of the leading competition. Moz Local Professional is available at $179/location per year. With a minimum of 100 listings, the full suite of organic SEO tools from Moz so that no part of your SEO strategy remains unmanaged. With Moz Pro, Keyword Explorer, Open Site Explorer and more, you can make sure the rest of your site is performing well to complement your local listings. Moz Local Premium is available at $249/location per year. Learn about all of the features in our new product packages by checking our new features page. See the new Moz Local in action by registering for one of our free webinars. Local search is exploding: According to Google, there are now more searches on mobile than on desktop, and 30% of all mobile searches are related to location. 76% of people who search on their smartphones for something nearby visit a business within a day, and 28% of those searches for something nearby result in a purchase. To borrow a phrase: Local has become the new front door. With this level of consumer behavior and these new product offerings, there’s never been a better time to give Moz Local a try. We look forward to helping you make Local your advantage! Questions about our new features, product packages or pricing? Leave a comment or contact us at help@moz.com.